Weeeellll…..it’s almost the end of January. How are you doing on your New Year’s resolutions? Then Christmas happened. Woohoo. Let’s add another five pounds! The Christmas pounds are officially gone–am now working on the hearty East European pounds. Then gonna work on five more ….just cuz. I don’t follow any specific plan. 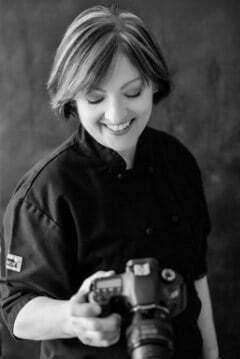 I try to make healthier choices, cut back on portions, cut out some of the bad stuff and just move more! It’s amazing what little changes can do! 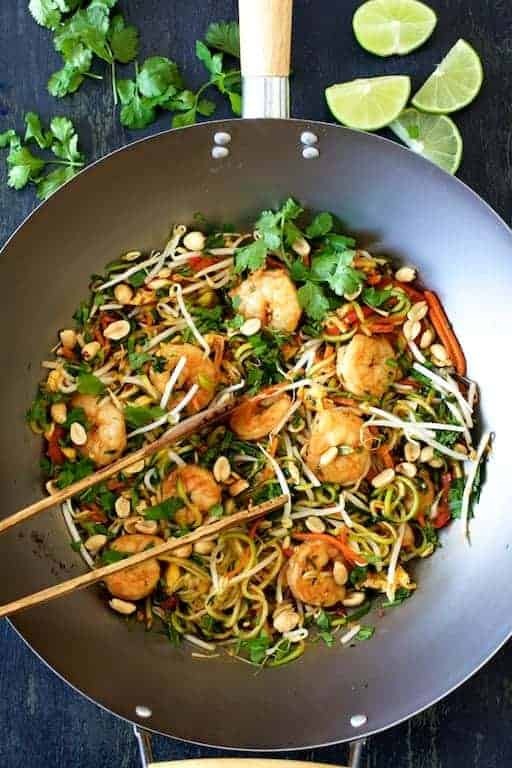 Here’s a fresh, flavorful and healthful way to help you keep your New Year’s resolution to eat healthier—Shrimp Pad Thai with Zucchini “Noodles.” This shrimp pad thai is full of fresh vegetables and lower in carbohydrates than traditional pad thai. 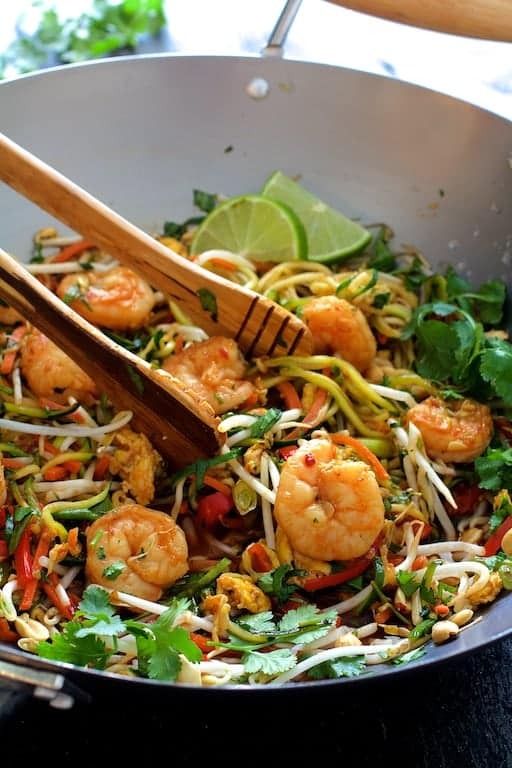 Pad thai is a dish that’s common in Thai cuisine—especially street food. It’s made with rice noodles that are soaked in water, stir-fried, then combined with vegetables and proteins such as eggs, tofu, shrimp or chicken in a sweet-spicy sauce. 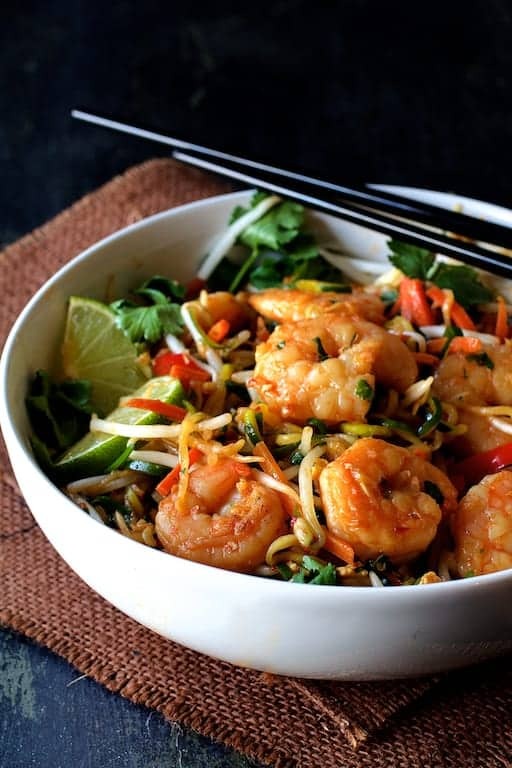 Once you get all the ingredients prepped, shrimp pad thai comes together quickly making it perfect for a weeknight dinner. Instead of rice noodles, I use spiralized zucchini instead. Zucchini contains a fair amount of water you don’t want diluting the vibrant flavors of this dish. After briefly stir-frying the zucchini, transfer to a sieve set over a bowl so some of the liquid drains out. (You want to be careful not to overcook the zucchini; it should still be slightly crunchy.) Cook the remaining ingredients, add the drained zucchini at the end and heat through. A question I receive frequently about fish sauce is what to substitute if a fish allergy exists. You can substitute soy sauce or make your own “vegan” fish sauce such as this recipe from The Kitchn. 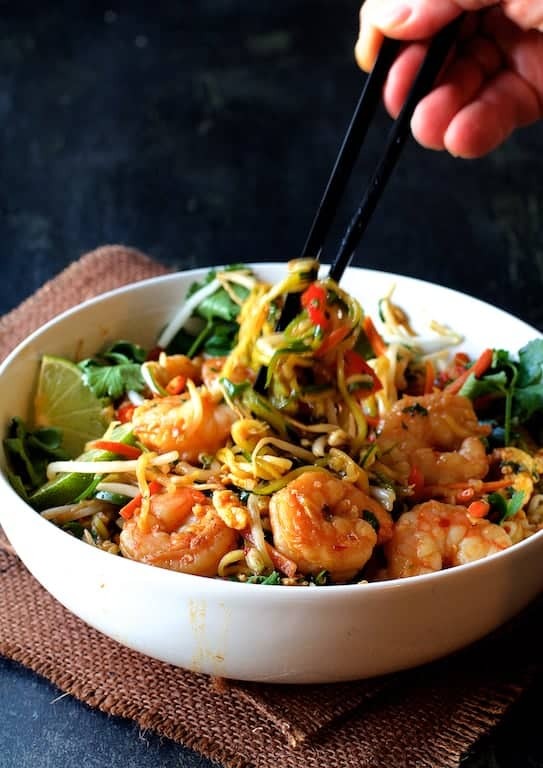 Shrimp Pad Thai, a classic Thai street food gets an update with zucchini noodles! Combine first 7 ingredients in a small bowl. Set aside. Heat 1 tablespoon oil over medium-high heat in a large skillet, sauté pan or wok. Add the zucchini and cook 2-3 minutes or until beginning to soften slightly. Transfer to a sieve placed above a bowl and set aside. Add 1/2 tablespoon oil to the pan, reduce heat to medium and add the eggs. Cook 1 minute or until set, stirring and breaking up the egg as you work. Transfer to a plate and set aside. Heat remaining oil over medium heat. Add red bell pepper and carrot. Cook 1 minute. Add the shrimp and cook 2 minutes per side or until cooked through and translucent. Stir in the sauce. Bring to a simmer. Add scallions, zucchini and egg. Stir until heated through then add bean sprouts. Serve immediately garnished with peanuts, cilantro and lime wedges. Very awesome. I love Pad Thai and cooking with shrimp and fish sauce. Thanks for the recipe and for sharing! Thanks Elaine!! Hope you enjoy!